Robyn and Patrick Morley talk to the CARA board Wednesday night. Behind them, wearing boots, is architect Christina Larson, whose Albany firm, Varitone, would design the project. A former industrial site overlooking the Willamette River east of Bowman Park is destined to become a housing complex. But it may be up to CARA, Albany’s urban renewal agency, whether it’s a standard apartment setup or a more ambitious design. 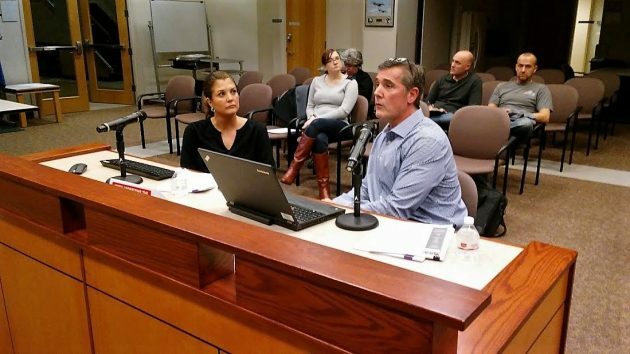 On Wednesday night the CARA advisory board heard from Robyn and Patrick Morley of Salem. The couple are the main principals — Robyn is president — of Willamette River View Holdings LLC. The venture bought the vacant 5.8-acre property on the river last spring for more than $1 million. Years ago the property was the site of a roofing-tile-making factory that was later demolished. The land is within the CARA district, having been added, after the district was formed in 2001, to encourage a previous development proposal that never got off the ground. 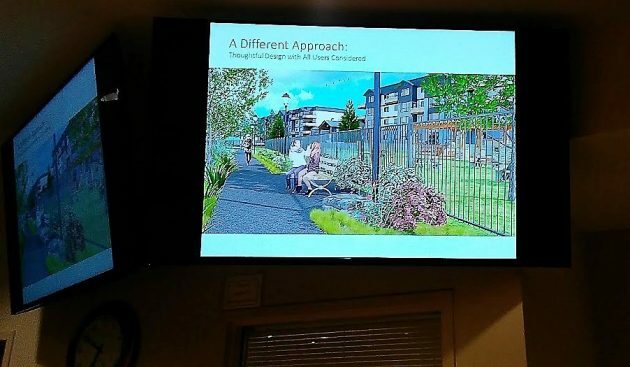 Though they had no specifics on Wednesday, the Morleys plan to ask for CARA help to build what they described as a multi-family development of mixed housing types totaling some 120 units. They say it would complement nearby amenities, namely Bowman Park, the Dave Clark riverside trail, and out-of-the-way Eads Park, and it would rejuvenate the entire Willamettte Neighborhood. Their concept calls for five separate buildings including a four-story apartment block with elevators on the north side facing the river, some “garden-style” walk-up apartments, and a set of townhouses on the south side facing Linn Avenue, where their firm bought two houses to ease the transition from single- to multi-family housing. The project would improve and put lighting on a path from Bowman Park downriver toward Simpson Park. What’s there now is an unimproved trail for walkers and bike riders. The city has an easement, but the trail doesn’t necessarily follow it. Varitone Architecture of Albany would design the complex. The firm’s principal architect, Christina Larson, was in the audience Wednesday. The Morleys said the kind of complex they have in mind would draw new residents and customers to Albany because it’s within easy commuting distance to Salem, Corvallis and Lebanon. But their concept would cost more than standard apartments, and more than they could justify as private parties in the business world. So they are looking for some kind of partnership with the city. How much? The figures have not yet been developed. On overhead screens, a concept of the riverside path that the development would improve. Another mini-Trump invades Albany. First the Diamond fiasco, now part deux. Giving away taxpayer money to rich folks has become way too easy in Albany. Some states make poor folks pass a drug test before receiving the cash. Should CARA require its rich welfare applicants and recipients do the same? Or better yet, require CARA board members pass the same drug tests. A thought to seriously consider is flooding. There are times when the Willamette “flexes” it’s banks & sends water right up to the entry gate for some days at a time. I do believe that high water mark would be in the area that this development is proposed. So if this & if that would CARA do another $40,000 give away for each completed unit?? And would people paying “big bucks” for river front units really want to be right next to the public horde that gathers at the boat ramp each summer??!! Flooding is a problem sometimes. In the 1996 flood you couldn’t get on to the property because the high water was blocking the entrance. When Permawood developed the site they put about a 100 dump trucks of fill that may have not been engineered for building on as they only stored sawdust there and parking. A later developer found several buried leaking barrels of oil from Hub City when they were there. There may be more. On the property owned by the city next to this site was found a buried barrel and it had a pesticide in it. This property is basically a dead-end area and 120 units is a lot of traffic going one way out. When there is a slow train on Water street they are cut off from emergency services for awhile. Only improved street is Geary. Chicago would need a retaining wall as it is much higher than this property so it is going to cost a lot of money to develop. The 2 houses he bought, I believe are on septic systems. Besides that there is a sewer main running through property and there is large setback required from river. All I can say is good luck; it does need cleanup. When was that property added to the CARA footprint. The property was added to the district on December 22, 2003. Council Resolution 2003-2. If the design is above the market and can’t be built without a subsidy, then it’s not worth doing. Sounds like time for a revision to the design. If the city wants to increase the inventory of affordable housing, then this project could not be further from that goal. Where do you live Chris? Maybe we could arrange some low income housing right next to you.